At the completion of the second Make It So competition, a 'bonus prize' was offered to several of us - a Design A Card. The guidelines mentioned it would be for a potential TNG boutique set and to use something that really hadn't been made into a card yet. Concept - I first started watching Star Trek with TNG and the first one-off villain they ever faced had never been made into a card - Zorn, from Encounter At Farpoint. How had this never happened? Several other options I had thought about were an Armus personnel that did something with Armus dilemmas, Riva's Chorus, the Code of Honor fighting and Q's Planet. After thinking about the options, I went with Zorn. Draft 1 - The original concept was to have him work with captives and commodities. I wrote up some crazy ability using both. He got discounts for captives and commodities and you could do great stuff. It completely fit what happened in the episode and covered everything. And it was only about three lines too long to fit on a card. Oops. Not fitting on the card is a problem. I cut it back, reworded some of it and made it less powerful. The first submitted draft looked something like a 5 cost, -2 if you have a captive, and while facing a dilemma stop him to download a commodity if you had a captive and some skills related to the episode. Draft 2 - The review from the designer came back with comments: Does he need to be expensive? Does he need to work with captives (limits to Cardassians)? 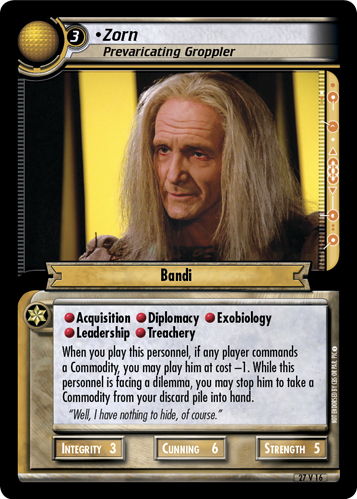 If its commodities, how do Dominion and Ferengi do capture? Lack of focus? All valid points, although I'm still waiting on something to make Changeling Infiltrator work. So on to revisions. First thing to address: lack of focus. As Capture limits the deck type fairly hard (when was the last time you saw a Romulan Commodity deck? ), that would be the first major revision. Dropping the cost to 4, with a -1 discount for Commodities works. dropping the captive part out of the ability works too. A couple other minor changes and it went back in. Playtest - I got a PM about playtesting caught an issue - the ability already kind of exists on a card, Base Commerce. So, they made the change to the ability - 'stop him to take a Commodity from discard pile into hand'. I had no issues with that as it still covered where I wanted him. Back he went to playtesters. They also dropped his overall cost a point. Almost There - A while later, I got another PM: Zorn survived playtesting. There might be a slight change to story from original submission (Creative had other ideas), and I saw a card that I had designed as an 'almost ready to go' finished piece.